Determined to continue their service, veterans deploy to disaster zones. When Rich Kulesa arrived as a Team Rubicon volunteer in a small Texas town flooded by Hurricane Harvey, he found neighborhood streets still littered with unsalvageable furniture, televisions, clothes, strollers — the entire contents of people’s lives mounded up on the curb. These post-disaster landscapes are familiar to volunteers from Team Rubicon. The nonprofit, which is elevating its technology capabilities through a new partnership with Microsoft Philanthropies, leverages the skills of military veterans and others to help homeowners and build community resilience in the wake of hurricanes, tornadoes, snowstorms, earthquakes and other natural disasters. Through that process, veterans often reconnect with the values and sense of shared purpose that were key during their service in the military. In Magnolia, Texas, it was several weeks after Hurricane Harvey, but hundreds of houses still needed “mucking out” — the dirty and potentially hazardous task of ripping out drywall, carpet, insulation and other material damaged by floodwaters carrying everything from dirt to chemicals and gasoline. Kulesa’s crew happened upon a Vietnam veteran who had remained in his home, which still lacked electricity and other basic infrastructure, in order to care for his dogs. With his permission, they started cleaning up and found a muddy, moldy American flag amid the debris. At the end of day, they quietly took it back to the church that served as the operation’s home base. After a few nights’ labor, the Team Rubicon volunteers properly folded the veteran’s flag and returned it to him at his house. Team Rubicon was born when Jake Wood, a U.S. Marine scout sniper who served in Iraq and Afghanistan, was frustrated by television news reports showing the devastation and a slow early aid response after an earthquake leveled the island of Haiti in 2010, killing and injuring hundreds of thousands of people. He and buddy William McNulty assembled supplies and a small team of veterans, first responders and medics and flew to Haiti to deliver medical aid to people who had yet to be reached by traditional disaster relief organizations. It turned out that the skills honed on military operations — small group leadership, logistics expertise, the ability to operate in chaotic environments — were also valuable in helping communities affected by disasters. Since then, the organization has grown exponentially. Team Rubicon’s now 73,000 volunteers, roughly 70 percent of whom are military veterans but who also include firefighters, teachers, emergency medicine technicians, mental health professionals and others with a willingness to help, have since delivered support in 230 disaster responses worldwide. Team Rubicon crews have cleared debris after the Los Angeles mudslides, blown snow from the roofs of senior centers after an epic New England blizzard and helped homeowners sift through wreckage in the wake of Illinois tornadoes. In recent years, they’ve focused their mission on domestic crises, providing aid after wildfires, floods and storms in the U.S. and supporting the mental health of veterans as they adapt to civilian life. That’s why Team Rubicon and Microsoft Philanthropies have entered a new strategic partnership to integrate the nonprofit’s core functions — from volunteer management and resource deployment to data analysis and mobile communication — on Microsoft platforms such as Office 365, Dynamics 365, Azure, Skype for Business, Intune, Operations Management Suite and others. Previously, the only Microsoft technology that Team Rubicon was using was Windows 10. But after a steady stream of conversations about pain points and opportunities to power Team Rubicon’s long-term vision, the nonprofit decided to overhaul nearly all the software platforms it had been using and fully convert to the Microsoft stack. To help enable that digital transformation, Microsoft Philanthropies will provide $1.8 million in technology, services and training to power the Team Rubicon platform with a new level of data-driven intelligence and flexibility. 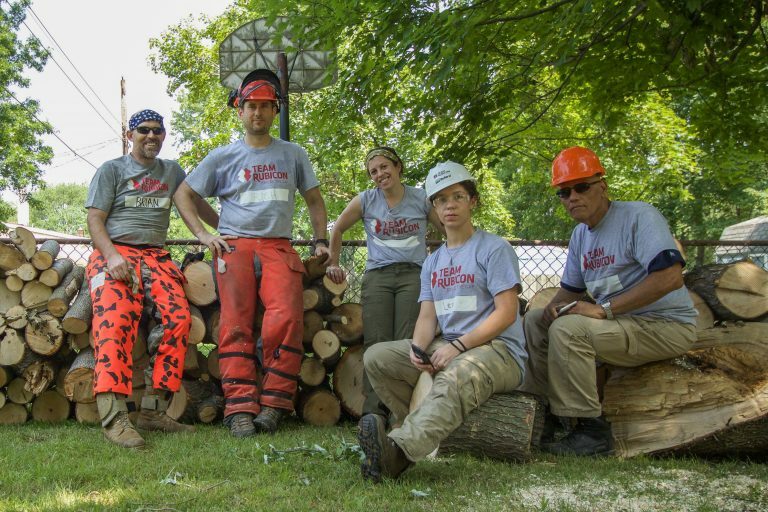 The partnership deepens an existing relationship between Team Rubicon and Microsoft Philanthropies, which will also continue to support the organization through employee giving programs and disaster-specific grants. Technology has never been better equipped to help in post-disaster situations, Spelhaug says, from smart sensors that can locate each piece of equipment and track how much power is left to AI solutions that can solve tough math problems to ensure that chain saws, fresh water or food gets deployed to the people who need them most. Supporting Team Rubicon is a natural extension of Microsoft’s longstanding support of service members in their journey from active duty to the next phase of their careers. The Microsoft Software & Systems Academy, for example, provides service members with critical career skills required for today’s digital economy. Unlike older humanitarian organizations, Team Rubicon came of age just as cloud services were coming online and was an early adopter of that technology. But like many nonprofits, it also wound up with an amalgamation of systems and processes that exist in silos. Holly Hellenschmidt, a U.S. Air Force veteran and regional technology manager for Team Rubicon based in Colorado Springs, is looking forward to an integrated system that allows leaders across the country to collaborate more effectively and share data and best practices — whether that involves automating routine tasks or taking a deep dive into their database to identify potential volunteer leaders. Hellenschmidt became one after five years of active duty as an Air Force Command and Control battle management operator, coordinating flight missions on bases in Qatar, Hawaii and Idaho. Afterwards, she went back to school to pursue a master’s degree in business administration and project management. But she still found it challenging at times to adjust to the open-ended nature of civilian life. Team Rubicon, which she discovered in 2012, deepened leadership and decision-making skills that weren’t always exercised in the military. For her, that’s included improving her region’s technical capabilities and developing training opportunities for cloud-based tools that have helped to grow a team of 12 leaders to just over 160 in her region alone. She was also selected for the nonprofit’s Clay Hunt Fellows leadership program, named after one of Team Rubicon’s founding members who took his own life in 2011. His death sharpened the organization’s focus on addressing mental health and reintegration challenges among veteran ranks. Hellenschmidt has also worked on operations ranging from the fires and floods that seasonally hit Colorado communities to a deployment in Gatlinburg, Tenn., where out-of-control wildfires burned more than 2,400 structures in 2016. Team Rubicon sent volunteers to help homeowners sift through the ashes of their homes and recover important items or keepsakes. As a situation unit leader on “Operation Blue Smoke,” Hellenschmidt was responsible for processing incoming requests. One day, she took a call from an elderly gentleman whose wife had recently passed away. His home had been destroyed in the fire, and he had been trying in vain to find a ring that had belonged to her. Hellenschmidt let the incident commander know about the special circumstances, and the next day she joined a team armed with shovels, wheelbarrows, goggles and breathing protection to sift through the rubble of his charred home. 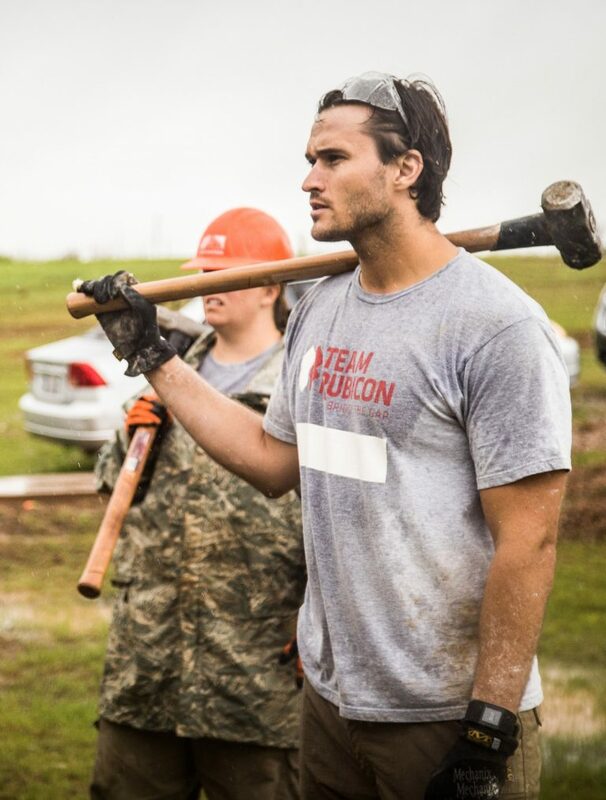 To learn more about Team Rubicon, and learn how you can support their mission, visit https://teamrubiconusa.org/give/. To learn more about nonprofit technology offers for nonprofits, visit https://www.microsoft.com/nonprofits.